We have put a lot of work into the week and have made it very successful. This week has been a theme week with dressing up each day from GREASE, Mardi Gras, Western Day, Marvel, Aloha Friday. 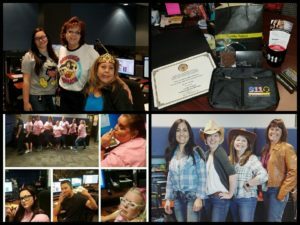 We were able to give each Dispatcher a SWAG Bag with a personalized coffee cup, headset bag, thin gold line bracelet and some small tokens from local businesses. We will be finishing off the week with a BLOCK PARTY!! Yes we are going to have Communications Personnel bring their families in to eat in which we will provide a Taco Bar with all the fixins! We will have SWAT displays, K-9 demo’s, Games for both kids and adults, popcorn, snow cones, Coffee bar and much more! We are excited and so are all the employees! It’s been a fabulous week!